Really nice docs on this disk detailing the command set and other info for the 1670. Also on disk is a terminal program completely written in BASIC for the 1670. Great place to learn to program for this device. 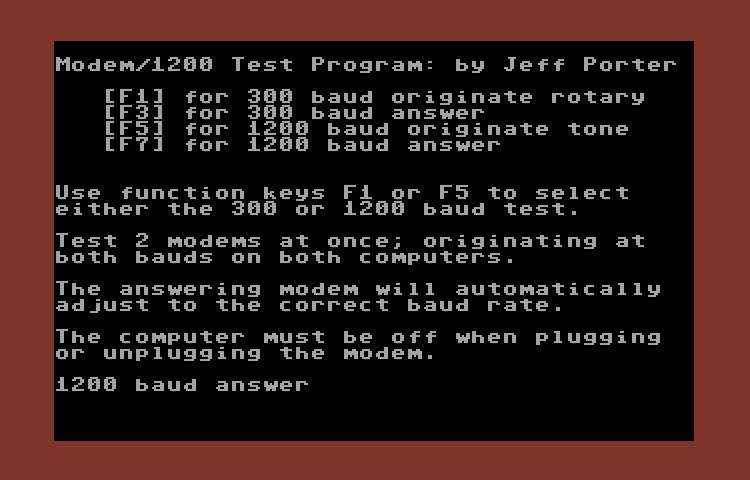 BBS Helper is a disk full of text files detailing everything you need to know about telecommunications from back in the day of the 1660/1670 modem. This isn't a program, but a disk full of logs from various BBSes back in the day. 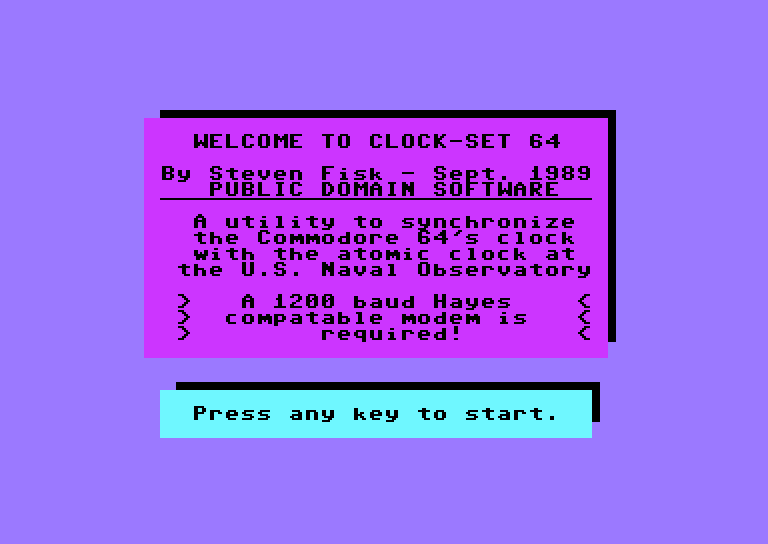 Clock-Set 64 by Steven Fisk, released September 1989 - This program was probably pretty neat back in it's day. It will dial-up the U.S. Naval Observatory to set the time on your Commodore 64. Tons of documentation included on the disk. Modem Battleship by Fred Phreaker - I don'y usually post games, but since I like telecommunications stuff from back in the day I thought I'd make an exception. This isn't really telecom related but this seemed like the best place to put it. Basically this program has four digitized messages you can play over the phone after calling someone. 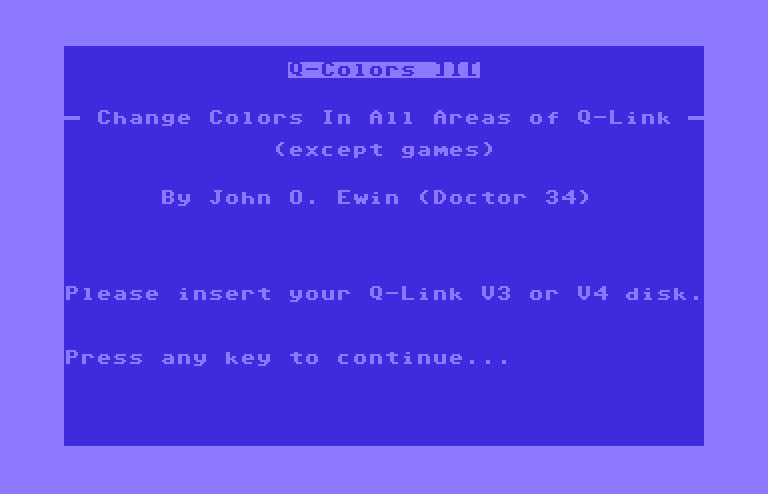 Q-Link Colors by John O. Ewin (Doctor 34) is a program to change the colors in the various Q-Link areas for Version 3 or 4 of the Q-Link app. QWKRR128 is an 80 column QWK format Offline Mail Reader for the C128 by Rod Gasson. It allows you to read and reply to BBS mail offline. This is the final version, including all source code and the "reggen.bin" program to generate a serial number that unlocks the full version. 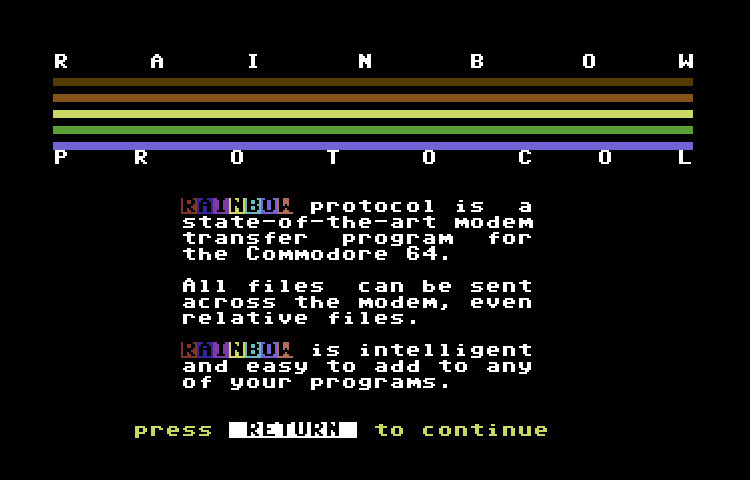 Rainbow protocol is a state-of-the-art modem transfer program for the commodore 64. All files can be sent over the modem, including relative files. Full docs on disk. I don't usually post files that aren't programs, but I ran across this really hilarious text file that defines what a real BBS sysop is and I can't help but share it with others. Break out a text editor or just a plain sequential file reader and have yourself a laugh. Fun disk full of text files about various telecom related topics such as crashing BBS systems and so forth. 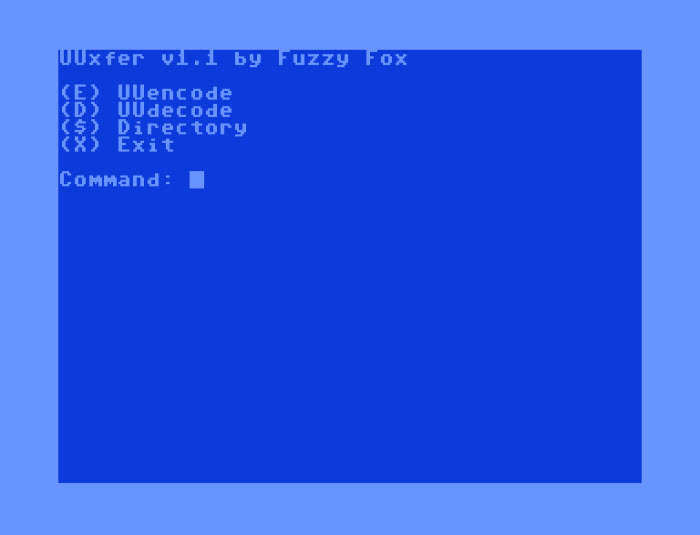 Uuxfer v1.1 by Fuzzy Fox is a program that lets you convert a file into text that can then be emailed and decoded on the receiving side.